Lunch scribbles / CSA week, uh, 11 I think? For lunch today, I ate a frittata of diced kielbasa, tomato, green pepper, and onion, served over white rice with a side of sauteed celery, and a little bit of beef gravy to give it some flavor and moisture. Frittata: a great way to stretch a single kielbasa sausage into six meals. Last night I made six “adult” meals as described above, plus two “little prince” meals consisting of leftover toad-in-the-hole and cut up green beans, as well as two “little princess” meals of pureed vegetable and cut up fruit (her bottles of pumped milk can’t be prepared too far in advance, or I’d do those too). I love The Unmanly Chef‘s series of 5 Days 5 Lunches but right now, with two adults, a three-year-old, and a ten-month-old, and limited fridge storage to boot, I’m happy to just get two or three days ahead of the game. Honestly, parenting is like treading water; you’re busy just keeping your head in the air. I’ve been neglecting the blog, but rest assured that we are still eating the fruits of summer and loving it here at the K household. Our patio garden has been going crazy and drowning us in hot peppers and cherry tomatoes. Every week, I get the CSA pickup and then drop by the Miller Library farmer’s market to fill in the gaps (usually with peaches from Lewis Orchard, onions and bacon from TLV Tree Farm, and sweet cherry tomatoes from Love Dove). So many beautiful colors! We’ve had corn every week and here it is again, 6 ears of it. 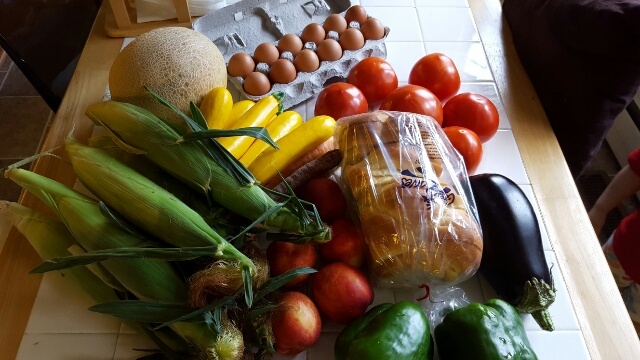 There’s also cantaloupe, yellow squash, rainbow carrots, nectarines, green peppers, eggplant, beautiful ripe tomatoes, eggs, and bread (Great Harvest challah). The corn got simply boiled (Little Prince’s favorite preparation) – I brought a pot of water to a boil, and then, so as not to waste the hot water (and the time it took to get hot), I used it three times: I blanched green beans, added salt and cooked a box of penne pasta, and finally sprinkled in some sugar and boiled the corn. The yellow squash got sauteed with some shrimp to go over the penne; eggs, green peppers and (some) tomatoes went into the frittata; later we’ll turn the eggplant into baba ghannouj or baingan bharta, and I’ll make glazed rainbow carrots (as well as steam some for the baby). Cantaloupe and nectarine are perfectly good as is, and fortunately both kids love fruit. Keep the fruit coming, Breezy Willow!